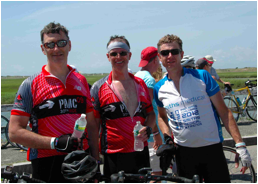 This is the 33rd annual PMC, and our 13th PMC. In spite of various challenges and complexities in our lives and the world in general, we remain committed to this exceptional cause and we ask for your support. The Dana-Farber Cancer Institute is one of America’s finest cancer research and care centers (repeatedly ranked in the top 5 by US News and World Report for cancer care, and four-star ranked by Charity Navigator for its efficiency with your contributions), and your gift allows Dana-Farber to do leading work in the field. With the support of our generous donors, over the past 12 years we’ve raised over $350,000 for the Dana-Farber Cancer Institute’s Jimmy Fund.